In October 2018, Google announced that it will be shutting down the consumer version of Google+ owing to insufficient usage. The company announced that it was too challenging to keep maintaining a product that could not meet consumers’ expectations. The initial announcement also stated that Google would complete the Google+ shutdown in 10 months. This wasn’t too surprising to a lot of social media marketers and experts who had been anticipating the downfall of the platform for a while. Since 2013, Google+ had been experiencing low activity. While there were 1.15 billion registered users, only 359 million of them were active on the platform. Stone Temple later discovered in 2015 that 90% of valid profiles on Google+ had no content. In other words, most users were not posting anything on the platform even though they had signed up. After the initial announcement of the Google+ shutdown, Google later discovered that a software update released in November contained a bug. Since this bug was affecting the platform’s Application Programming Interface (API) and some of its users, the company decided to expedite the shutdown. So instead of August 2019, it moved the shutdown date up to April 2, 2019. What does the Google+ shutdown mean for users like you? How will it affect social media marketers and businesses? But most importantly, what do you need to do to prepare for the shutdown? Let’s take a look. Creating unique and complicated passwords and turning on Password Alert for Chrome. A lot of Google+ users created a profile just to sync it with the other Google products they’re using such as Gmail. So they never really published posts on the platform or used it to interact with other users. If you’re among these inactive users, you won’t face much loss with the Google+ shutdown. 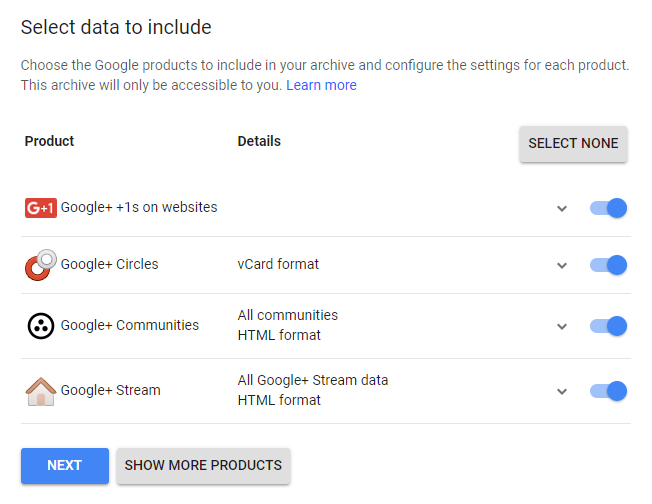 You have the option to download all the data from Google+. This will include data from your Circles, Streams and Communities as well as all your +1 data.The process is quite simple. You just need to go to the Download your data page and sign in if necessary. You’ll see that all your available Google+ data has been pre-selected as shown in the screenshot below. Click on “Next,” and you’ll have the option to choose from different file types, archive sizes and delivery methods. You can have the download link sent to you via email or add all the data to your Google Drive. You can even save it to your Dropbox or your computer’s online storage drive. 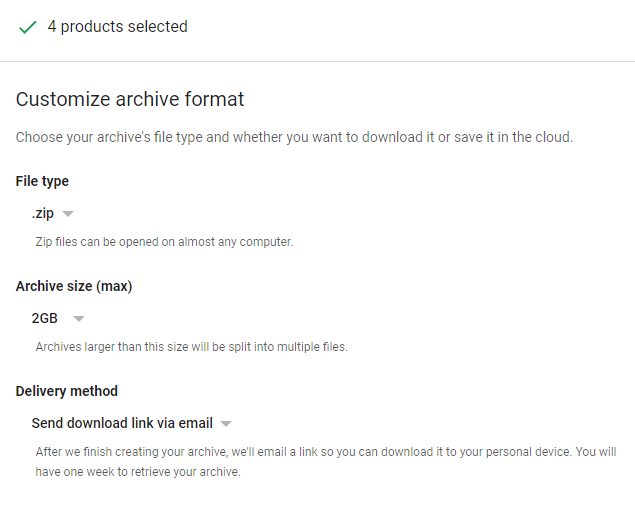 Select the options that suit you best, then click on “Create Archive” and that’s it. You may not necessarily need to save all your data from Google+. If you only want to download specific data such as your photos, events or posts, you can narrow down your selection. On the first page, you can deselect whichever data you do not want to save. 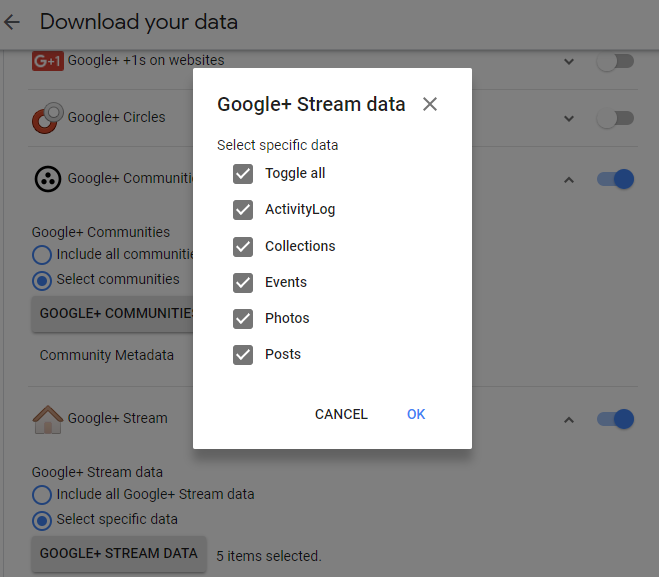 Even under your Google+ Stream data, you can further select specific data to save such as events, posts and photos. As a social media marketer, the next thing you’d want to do before the Google+ shutdown is to update your social strategy. While most social strategies focus on major social media platforms like Facebook, Instagram, Twitter and LinkedIn, some marketers also include Google+ as well. Remove the Google+ sharing buttons from your website and blog posts, and do the same for your clients. After the Google Plus shutdown, these buttons will turn into dead links. So you wouldn’t want to keep them around to create a bad experience for users or add broken links to your pages. If Google+ was a major channel to communicate with customers, you will need to replicate the same types of support you offered there through other social media platforms. This will ensure that prospects and customers can still seamlessly communicate with you using social media. If you do have an active Google+ page, be sure to alert customers in advance and link them to the other profiles where they can find you. If your Google+ page displayed important information about your business such as store hours, make sure you have that information available on other social media platforms. One of the biggest losses could be in terms of connections made through Google+ Communities. These communities might have provided excellent networks to market your products or services. If you own or moderate an engaged community on the platform, make sure you download your community metadata using the instructions given previously. This will help you store useful information such as names and links to the profiles of members, applicants, invitees and banned members. See if you can recreate the same community in the form of Facebook or LinkedIn groups to maintain your connections. If there were any posts on Google+ that performed really well, see if you can repurpose them for other social platforms. This way, you’ll be providing your social media audience with fresh content that is likely to perform well (because it has already proven itself on Google+). These posts can easily be incorporated into your social content strategy and repurposed for platforms like Facebook or LinkedIn. First phase – The first phase of the change rolled out on January 28. With this change, Sprout users can no longer draft, publish, queue or schedule posts for Google+. You can no longer receive new messages from Google+ in the Inbox, and you won’t be able to respond to or delete Google+ messages either. If you had any drafts or messages scheduled to go out after January 28, those would be deleted too.With this change, Sprout users are also no longer able to connect Google+ profiles in Sprout or collect new data on their Google+ posts, including scheduling new reports on Google+ data. 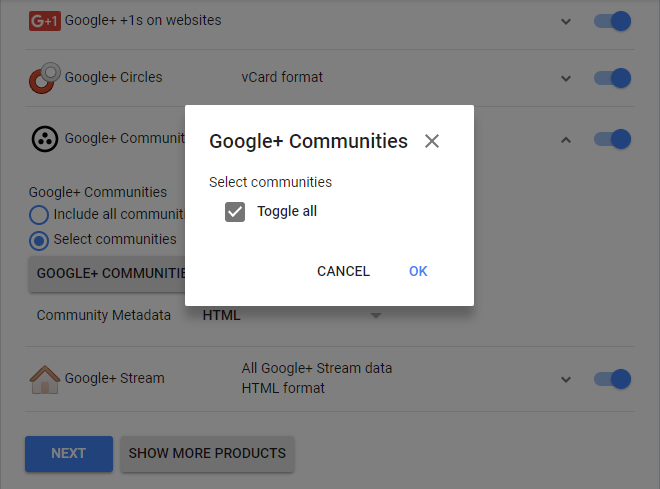 Since Sprout has discontinued all options to conduct new Google+ activity, it should make transitioning off the network easier. 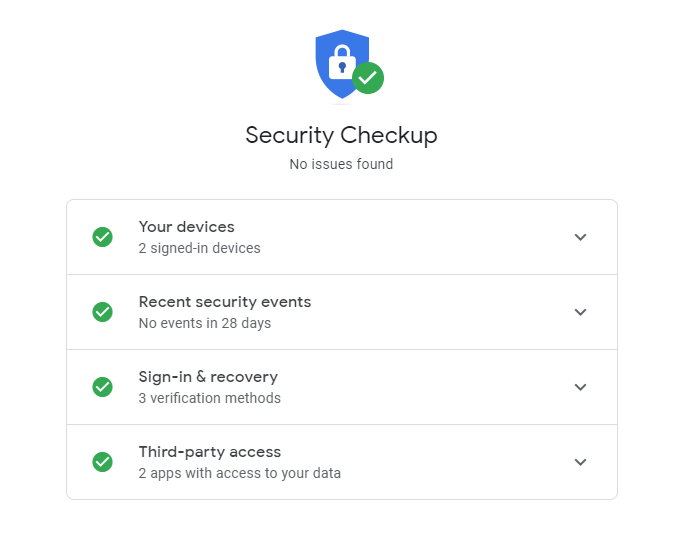 Second phase – The second phase of the change will happen on March 7, and at this point, your Google+ Inbox and sent message history will be erased, as well as past Reports data. Until March 7, you will still have access to historical messages, so make sure you download any Google+ data from Sprout that you’ll want to access later before then. Although Google is planning to shut down Google+ for consumers, enterprise access will remain unaffected. In fact, Google+ for Enterprise will go through a few updates and improvements. While announcing the Google Plus shutdown, the company also announced that there will be new features to cater to the needs of businesses. The platform has remained a valuable product for enterprise customers since it has helped co-workers engage in internal discussions and provided a secure corporate social network. So the company decided to shift its focus and adapt the platform into an enterprise product. Google will share more information about the new features and updates in the coming months. Were you expecting the Google+ shutdown all along? Or did it catch you by surprise? Have you made all the necessary preparations? Let us know in the comments below.